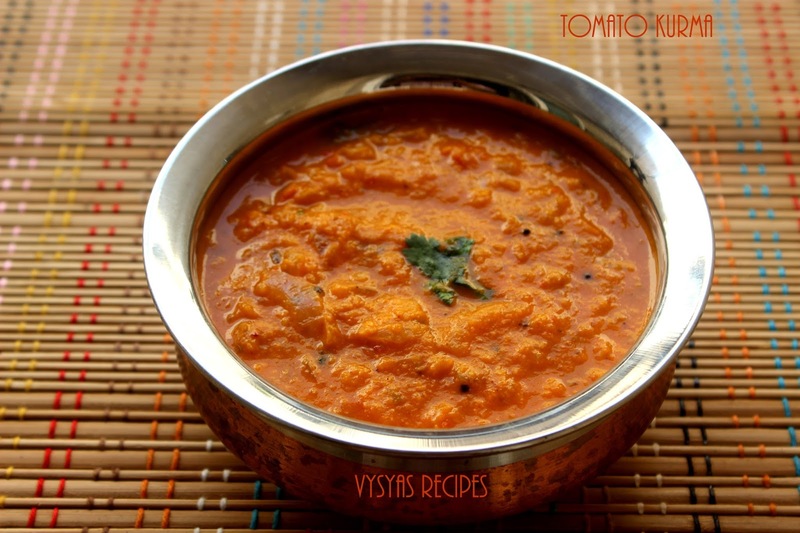 Tomato kurma is an Easy authentic Side dish from south India, that Pairs well with idli,dosa, chapathi,Roti,Poori & idiyappam. it is made with Sauted onions,simmered in tomato Coconut Paste. 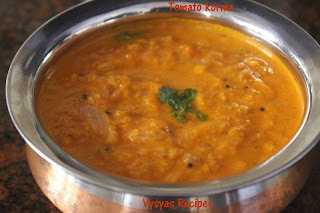 I learnt this Recipe from my Aunty Viji. In my home whenever,my mom makes Chapathi, she will prepare this kurma as side dish. it is Quick & Ease to make. Chop the onions,tomato & Garlic. Heat the oil, add Garlic when it turns light Golden brown colour. Add finely Chopped tomatoes,Coriander Powder,Chilli powder & Turmeric Powder.Saute till tomatoes turns mushy. Then switch off the flame.When tomato mixture cools down,Grind it along with coconut,cinnamon,cashewnuts & fennel seeds with needed water into a smooth Paste. Now Kurma masala is Ready. Heat the oil, add mustard seeds.when it splutters add cumin seeds.When it sizzles add curry leaves. Add onions.Saute till onions turns Golden brown colour. Now add Ground tomato Paste, with needed water. Give a quick mix. When it starts boiling add Garam masala & salt. Cook for few minutes till it is slightly thick & it gets gravy Consistency. Instead of chilli powder,you can use Red chillies while Grinding. Instead of cashews you can use fistful of fried Gram or khuz khuz. you can add cloves & cardomom while frying in oil.